FROM just treating it as a recreational sport, Chennai is fast turning into a surfing hotspot. 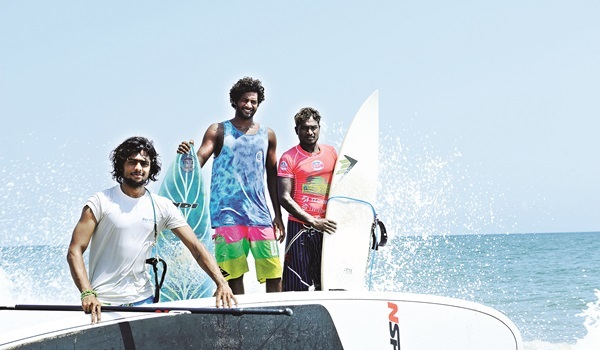 Murthy Megavan, surfer for nine years and founder of Covelong Point surf school concedes, a�?For the Mahabalipuram Classic 2011, there were eight people from Chennai who participated. The last competition in Chennai, Covelong Point Classic Surf Contest & Music Festival, saw nearly 55 participants from our city!a�? Arun Vasu, CMD of TT Logistics, and the co-founder of Septembera��s Covelong Point Festival, on similar lines, says, a�?The last three years, the city has really caught up with surfing. It is not just a hobby anymore.a�? While one surfing enthusiast combined his science knowledge with his passion to start an ocean literacy programme, another is busy designing customised board bags. Wea��ve rounded up some names you ought to know. M Sc Zoology graduate caught his first wave and the adrenaline rush in 2012 at Bay of Life (surf school in ECR) and though his parents worried about a�?how salt and the sun were darkeninga�? his skin, he combined his love for the waves and Zoology and started Campus Kovalam. Part of Bay of Life, his brainchild conducts ocean literacy programmes for children and teaches them about the ecosystem (geology and topography) of Kovalam. With over 1,000 students, he says, a�?Understanding the phenomenons occurring in the ocean can help swimmers and surfers act according to the tides.a�? Siddharth teaches surfing at the school and doubles as a lifeguard (certified from the Wilderness Responder course, Ranikhet) during the weekends. Surfing for fun, fisherman-turned-surfer Manikandan D, recently opened his own surfing school, Ocean Delight, at Kovalam. Initially a state volleyball player, he gave up the sport due to lack of finances to support his training. Manikandan, popularly known as Appu, has been catching the swell for the last nine years. His school offers free surf lessons to about 20 children, including girls, from the fishing community. a�?The sport does not see many women surfers. I wish to change that,a�? 25-year-old Appu says. He also kick started the Beach Ocean Life – Keep our Beach Clean initiative a�� and every weekend, these children double as volunteers to rid the place of plastic and other litter, and in turn get about `150 each. The money for this comes from Appua��s earnings and also from his German friend, Michael Becker, a piano engineera��who visited India and appreciated his efforts. In the 2012 Summer Swell Challenge, Dharani Selvakumar (23), made it to the semi-finals. He bagged first place in the national category at Covelong Point Classic Surf Contest & Music Festival this time. Hailing from the fishing community, it was an important win, and Selvakumar says, a�?After a computer science engineering degree, when I decided to get into full time surfing, my father was reluctant. Today, I am a surf instructor (with a stable income) and my parents are okay with it.a�? Coaching many young aspirants at Covelong Point Social Surf School, Selvakumar is also a celebrity coach with actors Arya, Bharath and Jiiva learning from him. a�?I still remember how Bharat, who did not know swimming, was initially afraid. But later he managed to catch his wave,a�? says Selvakumar. Suhasini Damian enrolled at the Kallialay Surf School in Pondicherry, three and half years ago, and shea��s yet to discover a sport that she can love more. Conceding that ita��s not easy for a woman to pursue the sport in our country, she adds, a�?I always get dirty comments and guys whistling at me when I walk to the beach wearing my rash vest and shorts. I have had nine-year-old kids throw small stones at me from the pier while surfing. Until today it hasna��t changed.a�? Undeterred, she does hope, with the growing surf scene in the country, that people will learn to change their attitude towards young women surfers and swimmers. At 24, she has already placed first at the Summer Swell Challenge in Pondicherry and at the Covelong Point Festival, shea��s come first in the national category over the last two years. She has also successfully set up Esendi, the beachwear and surf accessories business, with her friend (Dasha Yateseko) in Auroville. Esendi includes customised swimwear, beachbags, beach wraps and customised boardbags and more.